My drawings strive to evoke a sense of space as well as form. Not just the positive and negative compositional space on paper, but space imagined by the mind’s eye as well. Accordingly, the compositions are often suggestive and/or intriguing rather than literal and/or appealing to our traditional sense of beauty. I think of my work as a search for meaning rather than a statement of perception. Having always been drawn to nature I find that biomorphic images come to me quite readily. I also respond to the sense of history and intrigue embedded in old vernacular architectural structures. 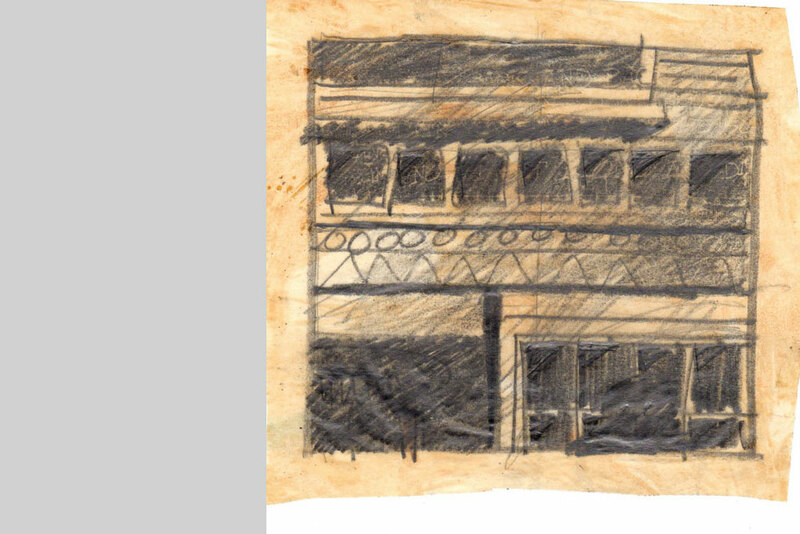 Each drawing begins with a thumbnail sketch which is enlarged and loosely transferred onto the final drawing surface. The drawing evolves from there with technique playing an active role in the process – I want the image to look drawn and the technique to be an expressive aspect of the work. Hopefully the finished drawing achieves the right balance of order versus chaos, the familiar versus the unknown, and the literal versus the suggestive. These are from an old sketch book from the 1960s. I have always had a sense of intrigue with evocative architectural facades and (of course) with bones.